Today we took a boat to Manutik Island for a day of beach and swimming. The boat was shared with other day trippers to the island and took about half an hour. The beach is white sand & there are coral areas marked out with lines for safe snorkelling. As it was a Sunday, the beach was busy with many day trippers enjoying a day out. There were also other watersports facilities available for hire. We quickly changed to our swimming trunks & dipped into the warm water to cool down in the hot & sunny day. The corals were not spectacular but there were many colouful fish swimming along with us. Lunch was a barbeque cooked by the island staff with plenty of seafood, chicken, meat, vegetables, noodles & rice for everybody. After lunch we headed off to another nearby island, Manukan, to inspect the Manukan Island Resort. This is a lovely resort resting on the island's long stretch of white sandy beach. All the rooms are large & built in traditional style as wooden chalets & bungalows within a short stroll of the beach. Although during the day the beach is busy with day trippers, by mid-afternoon the beach is emptying and reclaims its calm & peace. We got back into the boat and returned to Kinabalu city, but the return boat journey was rougher than the morning as the sea began to pick up with a sudden change of wind direction and the blackening clouds indicating a rainstorm on the way. It rained half way through our ride. This sudden downpour was a regular feature of our stay during the late afternoons in Borneo even during the dry season of April and May. Tonight we checked into the 4* Promenade hotel. We are using this hotel in our Superior hotels category. This hotel is in an excellent location at the waterfront within easy walking distance to shops, restaurants, bars & markets. Today we had the best meal in town in the night market. 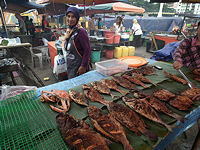 The food section of the market vibrates with life in the evening with many stalls barbequing their daily catch from the sea. The smoke fills the air under the bare light bulbs of the stalls. Husbands & wives or other family members are all busy cooking the seafood as well as popular chicken wings over their barbeque fires. The smell of smoke & cooking meat are overpowering in the still humid evening air. There were so many choices but we settled for a barbequed fish (medium size) & one huge king prawn (about 7 inches) each with some fried rice. The lovely chilli sauce dip went down very well with the seafood. The prawns were bigger than any prawn I have had in UK. They were delicious & the best value. Now when I think of king prawn I think of Kota Kinabalu. 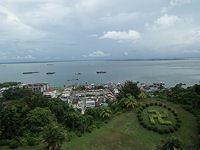 Next morning we transfered to the airport for our flight to Sandakan in Eastern Sabah. We were met by the local guide and took a tour of the town including the Central Market, St. Michael's Church & Chinese temple & observation pavillion for a bird’s eye view of Sandakan city. 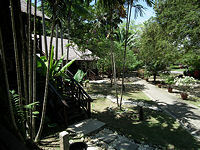 In the afternoon we drove to Sepilok Nature Resort & checked in for overnight. This is a lovely resort built on the edge of the rainforest. The rooms are individual wooden bungalows built among the trees & plants with pathways & wooden bridges over streams & ponds in a very natural setting. 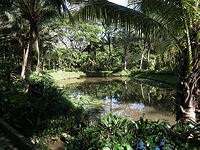 The sounds of birds & insects are heard everywhere loudly. Many types of birds can be seen flying from tree to tree in the resort woodland. Fish were swimming in a large pond under the decking. At night it was peaceful & quiet for a relaxed & gentle sleep. Next morning we were ready to be transferred to the river pier for a boat ride to Libaran Island. 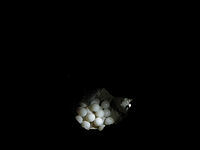 The reason for going to Libaran Island is to see the big event of a mother turtle laying her eggs at night. This is an unique outing but requires extreme patience & tolerance of the long hours of waiting to witness this fascinating event. 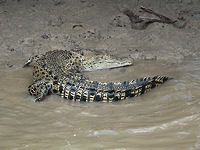 On the river we saw monkeys and crocodiles. We arrived at Libaran Island in time for lunch at Mid-day. After lunch we took a short guided tour around the local fishing village for about half hour & took the rest of afternoon at leisure. Although Libaran Island has sandy beach all around the island it is not good for swimming & sunbathing due to the large amount of driftwood and rubbish washed in from the sea. The accommodation was also very basic with no television or other facilities to while away the long waiting hours. The sun was hot and it was best to retreat to our room for a rest. At about 4 o’clock in the afternoon we & another two parties from different groups all met up again for another boat ride to the nearby Selingan Turtle Island. This is the island to watch turtles to lay their eggs. Turtle Island has beautiful white sandy beach with clear water and swimming is allowed on the island until 6.00 pm. After that, the beach is out of bounds before the turtles begin appearing later to lay eggs. We were shown first to the Turtle Hatchery gallery, then shown a short film about the island & the turtles. By about seven o’clock our guides laid out a packed meal box for our dinner on the outside wooden benches & tables. By now darkness had fallen. The only lights were inside the centre for a restaurant & toilet facility. 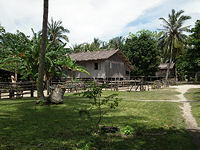 The restaurants are used by people who are staying overnight on the island. After dinner, there was little to do except sit in the dark amongst the insects. Due to the large numbers of people coming for this event there are normally two viewings of the turtle laying eggs. The centre divides the visitors into 2 groups of about 20 people. The Turtle Centre staff patrol the beaches, waiting for a mother turtle to come onto the beach & dig the hole for her eggs. Then they will have to patiently wait while she carries on digging the hole which can take one to two hours. When she is starting to lay, the staff come in to take the first group for the viewing, which was at about 9.00 pm. Unfortunately we were in the second group and had to wait until nearly midnight. I think by then most of the people in the second group were very tired & showing a certain lack of excitement. It was quite a sight to see first of all a very big mother turtle balancing herself inside a huge hole that she had dug. She did not seem to notice or worry about the 20 people circling behind her to watch her eggs dropping out into the sand. The eggs look like soft ping-pong balls and the staff pick them up quickly and transfer them to a bucket before she starts the process of burying the eggs. The staff then take the eggs to the hatchery where they are reburied in a marked pit, protected from predators. That night the mother turtle laid 91 eggs. Also, in the evening, eggs which have been buried 90 days before start to hatch and the centre staff keep the little baby turtles and later release them on the beach, near to the water and they run forward to the sea to start their long life journey. The point is to protect the eggs and babies from predators, but even so only about 1-2 percent of the babies will make it to adulthood. It was fascinating but we were exhausted by the long day of waiting & transfers. We returned by boat to Libaran Island at about one in the morning and slept for about 5 hours with an early boat departure at seven back to the river pier near Sandakan.